I went to Iso-Valkee in November, a day before the snow, and I didn’t see any swimmers. 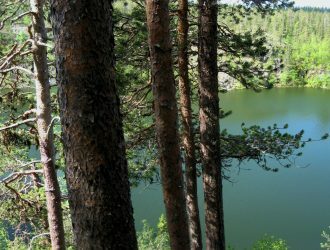 The lake was partly open as it is up to 24 meters deep and has some natural springs. 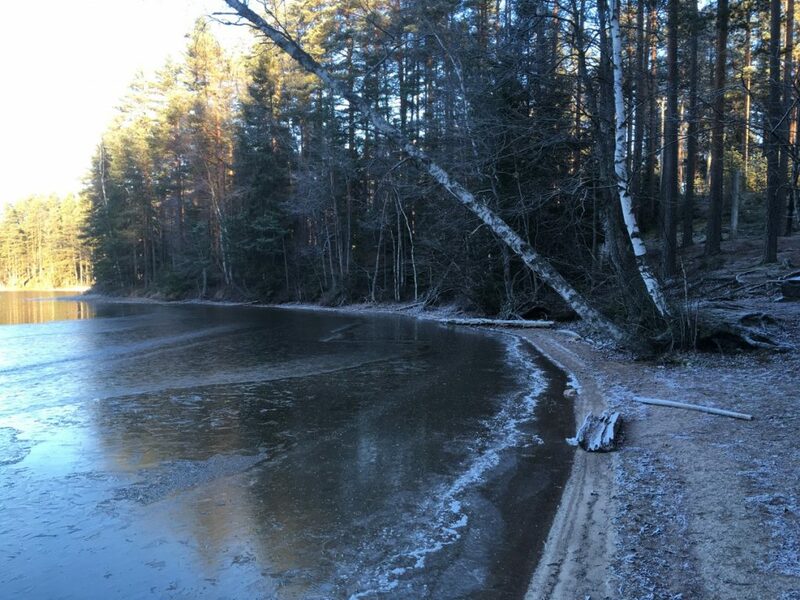 But winter is coming and ice had already formed to some parts of the lake. I didn’t see any ice-skaters either. It was a sunny day, but the sun was low in the sky at this time of the year. The lake was steaming because the air was probably colder than the water. The following maps are provided by the city of Somero. P is the parking lot and S refers to sauna. The trail goes around the lake and I started walking it anti-clockwise, heading first towards north. When I left the parking lot, I saw a gate, which is there to prevent the cars going further but it doesn’t mean you are not allowed to walk past it. So I passed the gate and soon spotted an arrow pointing north, leading away from the lake and passing the first peninsula. It was the starting point of the trail, which is clearly marked with blue paint on the trees. 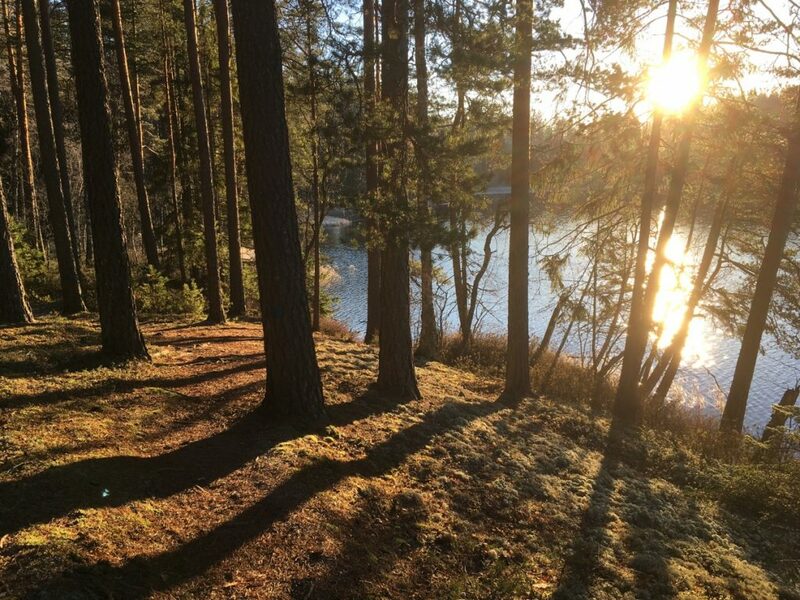 The trail soon goes back to the shore of the lake and follows the shoreline almost around the whole lake. Only one area just before returning back to the parking lot leads you deeper into the woods and away from the lake. This is because somebody owns a cottage by the lake and doesn’t allow trespassing in their property. The trail goes around the property and then comes back to the lake. There is a small pond west of the lake where you can also go along the guided trail, but I kept following the blue marks around the lake. 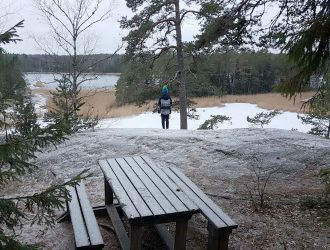 Close to the parking lot where the trail begins, there is a peninsula that has a lean-to shelter and a sauna. 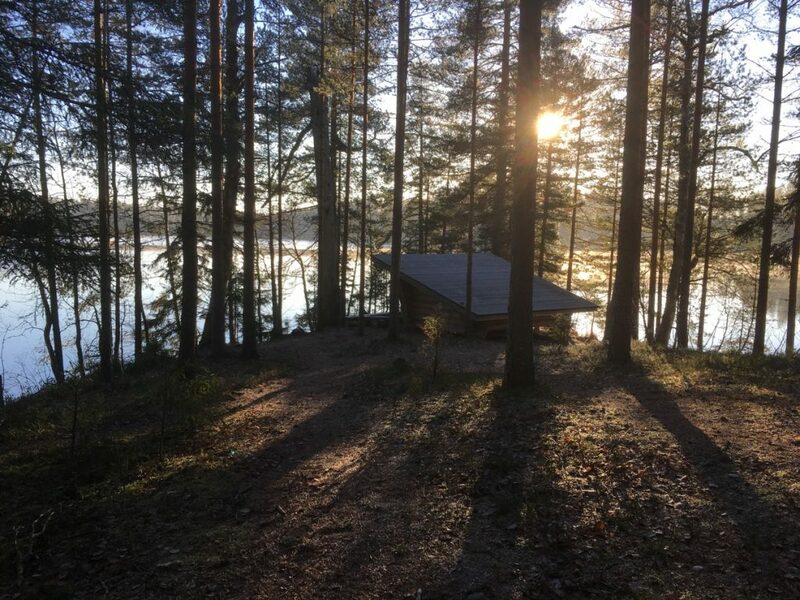 The sauna at Iso-Valkee is owned by the city and can be rented, for more information contact the City of Somero at tel. +358 2 77911 or email info(a)somero.fi. The lean-to shelter is free to use, but there’s also another one approximately 1,5 km along the trail in another small peninsula. I decided to head to the second lean-to shelter. The best beaches for swimming are close to the parking lot. The trail was easy to follow, but it wasn’t in the best condition. There were many trees that had fallen over the trail and hadn’t been cleared away. I wouldn’t recommend riding a bicycle on this trail because of the trees, and the fact that this trail is not very long. Dog owners seemed to enjoy this area with their best friends. All dogs were on the leash, perhaps because of the possibility to run into other dogs. As this area is not a national park, it is mainly visited only by locals. At the shelter I sat by the fire and enjoyed the beautiful views. 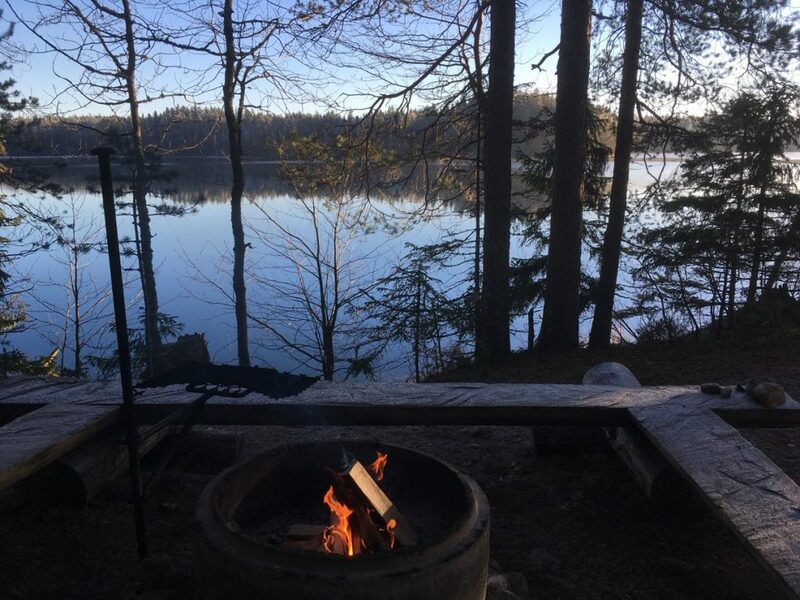 You should remember that lighting campfire is forbidden also at these lean-to shelters if the forest fire warning is in effect. Check the latest information on forest fire warnings at the Finnish Meteorological Institute’s website. There are over 10 geocaches in Iso-Valkee area near the nature trail. 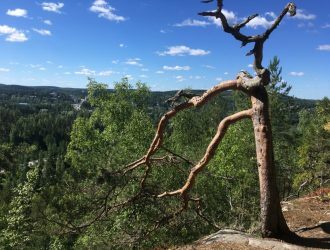 Geocachers should notice that because this is Natura protected area, the caches won’t be high on the trees or deep on the ground, thus no climbing nor excavation needed. 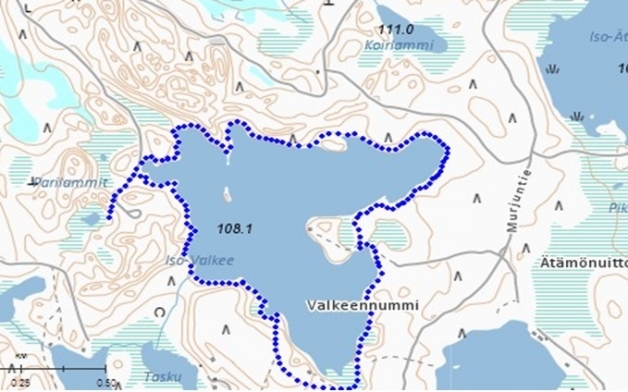 And in case you are looking for a challenge, the nearby Pikku-Valkee lake hosts one cache on an island. 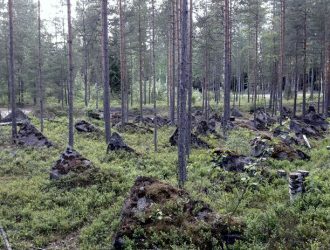 Iso-Valkee is part of Hyyppärä ridge area, which is part of Natura 2000 -program. 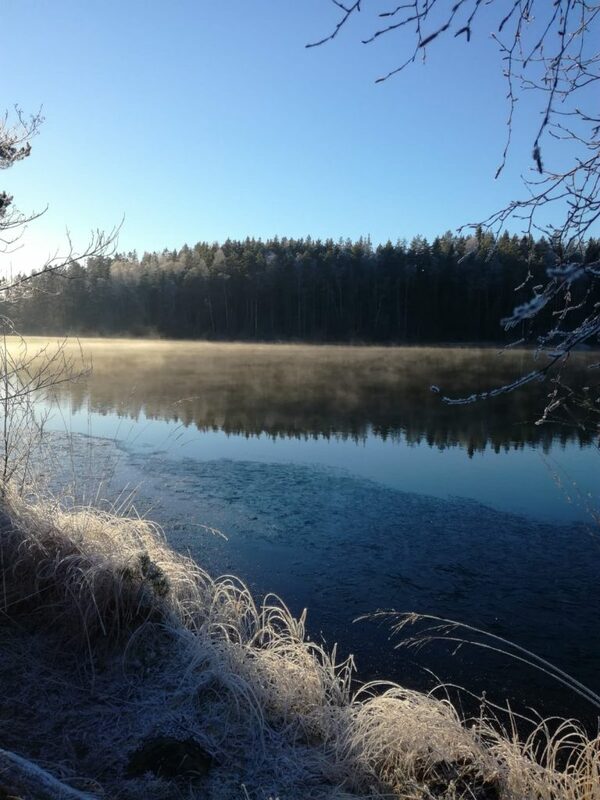 Natura 2000 is protecting the natural habitat, which is special in this area and also the reason why lakes are so clear. There are multiple lakes and also multiple water pumping stations to the City of Salo in this area and the area has been on the news constantly because of the water table usage. The permissions for water usage in the Natura 2000 protected area are temporary and subject to monitoring. Earlier, during the water table pumping, the water levels in the lakes were low and caused major concern over the wildlife in the area, including the whole habitat, natural springs and protected freshwater pearl mussel. The most affected lakes are Lake Kalaton and Pitkusta lakes few kilometers away from Iso-Valkee. Salo Water’s temporary permission expired in the beginning of this year and since then the water levels have been slowly rising, which can be considered as a sign that the water table usage has an impact to the water levels in the lakes. 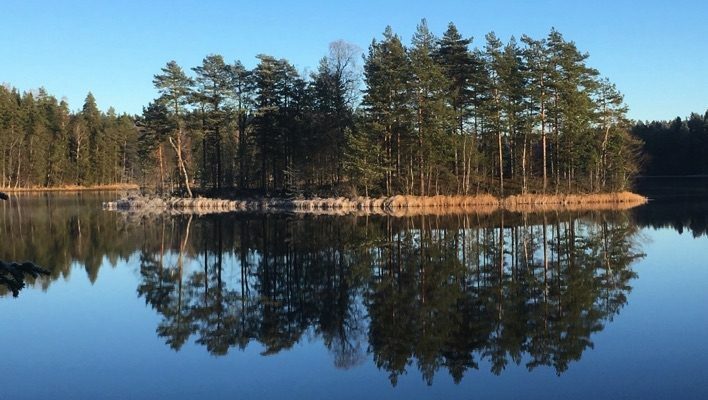 In October the Regional State Administrative Agency for Southern Finland therefore rejected the permission for water usage in this area. Unfortunately Salo Water has shockingly now challenged that decision and the case remains to be settled in court. Car: Set the address “Murjuntie Somero” to your navigator and once on Murjuntie, follow the black signs to “Iso-Valkee”. 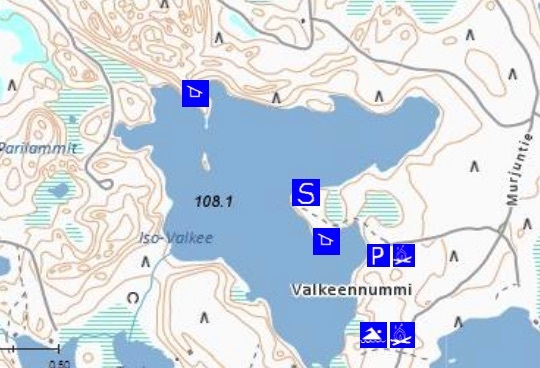 Iso-Valkee lake is located in Somero about 100 km Helsinki. From Helsingintie road turn to Kaskistontie, and from Kaskistontie to Murjuntie. Public transport: Unfortunately there is no public transport to Murjuntie. The closest bus stop is 5 km away in Helsingintie close to the Kaskistontie intersection. It is called Terttilä th P, Somero, in case you are looking for the tickets from Matkahuolto. Bicycle: Cycling from Somero to Iso-Valkee takes about an hour and fifteen minutes. Accessibility: There are no services for the disabled in the area, but the area is suitable for families with children.